Fulfil your dream of building your own saw now! There is nothing more satisfying than being able to work with your own self-made tool. This page provides you with (almost) all the parts required: nuts and bolts to fasten handles, slotted backs and prefabricated saw blades. Get started by manufacturing your own saw. Resources: Making your own saw, while a very rewarding project, can be daunting. While there is no substitute for actually making one, many of us are not inclined to jump right into things. These resources will help you get started on your saw. This series of blog posts covers the construction of a saw from start to finish. 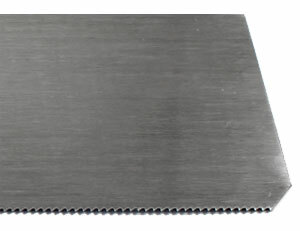 A variety of saw handle templates are available as downloadable pdf's. These saw parts are made by Blackburn Tools in the USA. The split nuts are 5/16 inch (8 mm) long, giving enough thread engagement to virtually guarantee that it will never strip, no matter how hard it is tightened. 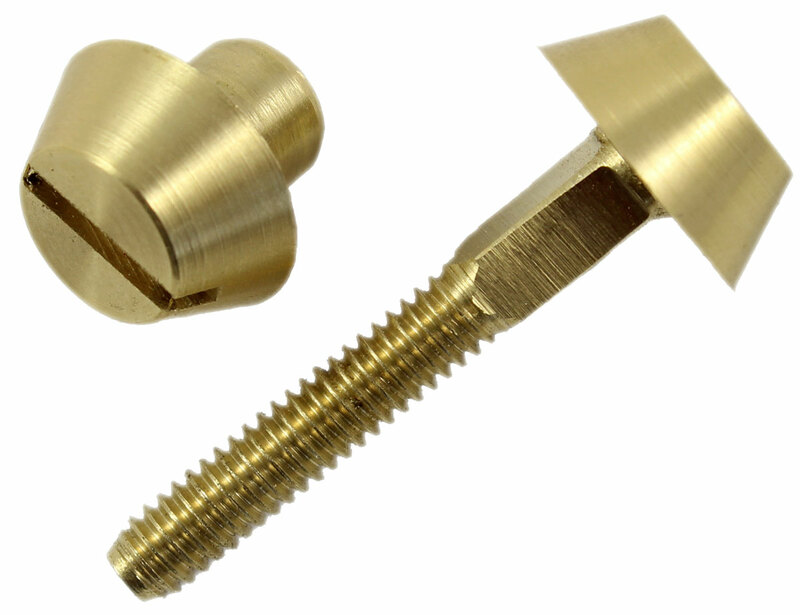 Both the bolt heads and nuts have tapered sides, making them easy to install and remove without spelching. This is of great utility test fitting the handle. 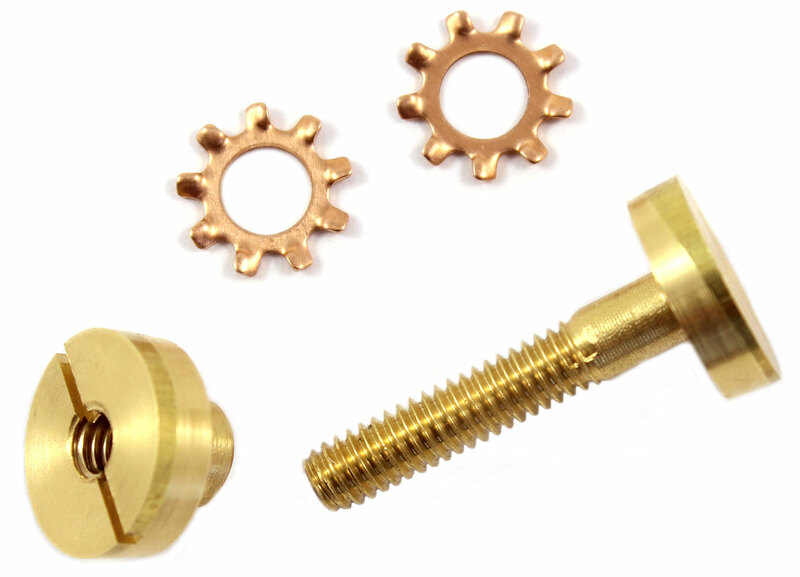 Instead of a square shank on the bolt, a toothed washer is used to prevent rotation of the bolt. 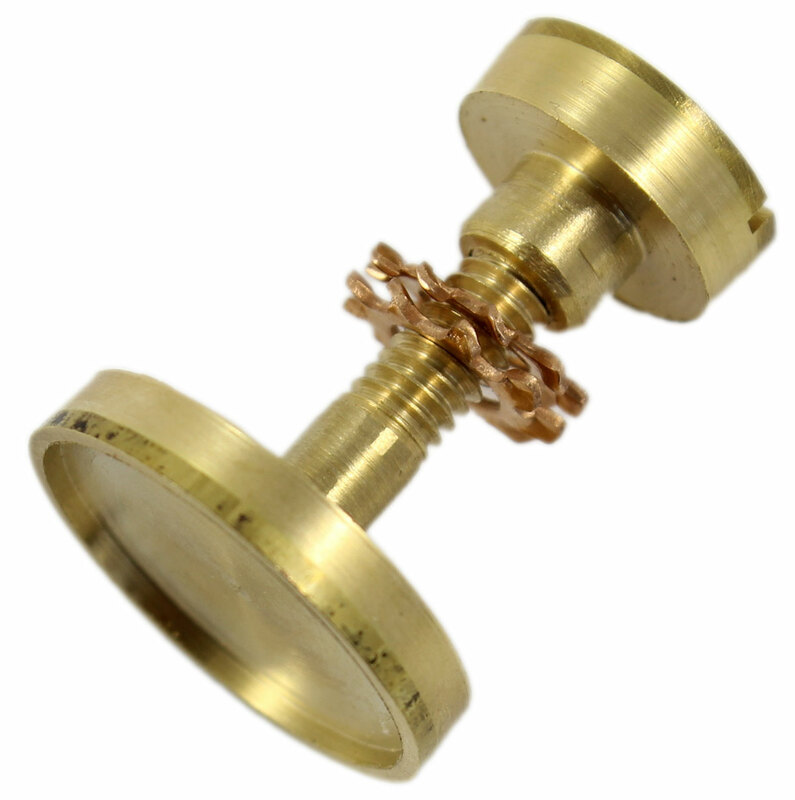 To compensate for the thickness of the washer, the nut is made slightly thicker than the head of the bolt. Both the bolt and nut can be installed flush with the surface of the handle with a single counterbore depth. The length of the bolt is 1.025 inches (26 mm), and will fit handles as thin as 13/16 inch (20.6 mm). The split nut slot is 0.032 inches (0.8 mm) wide. If you do not have, and do not wish to make your own driver, we strongly recommend purchasing our saw nut spanner. Installation notes: Each bolt/nut set is sent out with two lock washers. One of these goes under the head of the bolt, whilst the second is held in reserve, to be pressed into service when the first falls into the sawdust pile. Alternatively, it can be stacked on top of the other to bring the head of a bolt flush to the surface of the handle if its counterbore is drilled too deep. Close examination of the washers will show that the teeth are sharper on one side than the other. The washers should be installed with the sharper side against the metal, as it will more effectively bite into the metal. 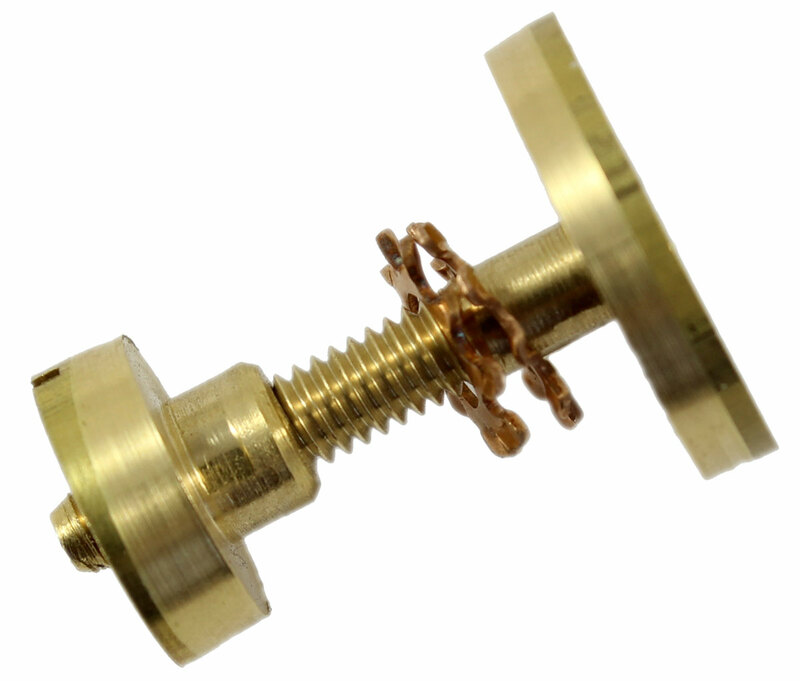 Sold by the set, a set being comprised of one bolt, one split nut, and two lock washers. Blank medallions are 3/4 inch (19 mm) diameter, and are available with flush or sunken faces. You can hand grave or laser engrave them with your initials or design of your own creation. The length of the bolt is 1.025 inches (26 mm), and will fit handles as thin as 13/16 inch (20.6 mm). 3/4 inch (19 mm) 1/2 inch (12.7 mm) Currently not in stock! For a relatively brief period in the mid to late 19th century, Disston and other saw makers adorned some of their saws with bolts and nuts whose heads are best described as truncated cones. With their hardware standing well proud of the handle, these saws possess a bold and distinctive air. Because they soon fell out of favor, replacement bolts and nuts for these saws are hard to come by. Now, 150 years later, Blackburn Tools offers a modern version of this hardware. These new bolts are available in large and small variants. For those making new handles, this is very simple and forgiving hardware. Because the heads are not sunk into counterbored holes, a clean installation is not dependent on precisely drilled holes. To further ease installation, the slots on these nuts (unlike those on split nuts) require no specialized screwdriver or spanner. The bolts have square shanks that can be mortised into the handle to prevent rotation when tightening the nut. Threads are 8 - 32 UNC. 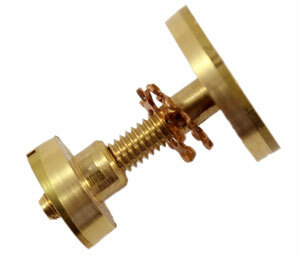 Both bolts fit saw handles ranging from 9/16 inch (14.3 mm) to 1-1/16 inch (27 mm) in thickness. You will need to cut or file the threaded portion to length, a relatively simple task. Instructions for doing so are below. Dimensions of large type: The nut has a slot that is 0.050 inch (1.3 mm) wide and 2 mm deep, and requires no specialized screwdriver or spanner. To avoid mangling the slot, please select a properly fitted screwdriver. The maximum diameter of the bolt and nut heads are 0.530 inch (13.5 mm); their heights are 0.205 inch (5.2 mm). The bolt shank is 0.160 inch (4.1 mm) square. Dimensions of small type: The nut has a slot that is 0.032 inch (0.8 mm) wide and 1.4 mm deep, and requires no specialized screwdriver or spanner. To avoid mangling the slot, please select a properly fitted screwdriver (this may require some grinding of the blade to thin it out). The maximum diameter of the bolt and nut heads are 0.430 inch (10.9 mm); their heights are 0.125 inch (3.2 mm). 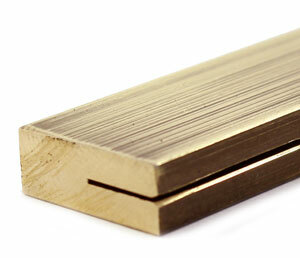 The bolt shank is 3/16 inch (4.8 mm) square. You are right: wider than the large type! Installation notes: Measure the thickness of the handle (including any washers that will be used under the heads of the bolts and nuts). This is the length to which the shank of the bolt will be cut. The bolt can be shortened with either a hacksaw or file. After cutting or filing, round the cutted edge of the thread slightly with a file. Filing the edge makes it easier to thread the nut onto the bolt. Whether you are building a small dovetail saw or a tenon saw suitable for small timber frames, you will find a suitable back here. The edges come square, but can easily be chamfered, rounded, or shaped to simulate the look of a folded back with files. 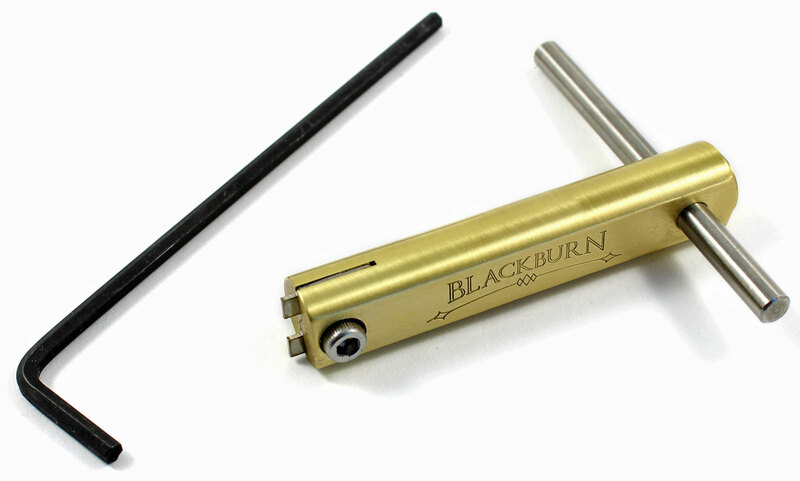 Slots are accurately milled to ensure a good fit that requires a minimum of truing or adjustment after assembly. Blades can be held in the back with epoxy, rivets or screws, or by squeezing the slot closed (in which case the blade is held in place by friction, much like a folded spine). All sizes of backs are available in brass. The 9 inch back has a diameter of 3/16 x 5/8 inch (4.8 x 15.9 mm), the 10 inch back 1/4 x 5/8 inch (6.35 x 15.9 mm), the 12 inch back 1/4 x 3/4 inch (6.35 x 19.05 mm). The slot of the 9 inch back is 0.250 inches (6.35 mm) deep, the slot of the 10 inch and 12 inch back 0.300 inches (7.6 mm). Whether you are building a small dovetail saw or a tenon saw suitable for small timber frames, or simply replacing a worn out blade on an old saw, you will find a suitable blade here. All blades are made from 1095 spring steel, hardened and tempered to Rc 48-51. The teeth are punched, but not sharpened. Rip teeth are punched with approximately five degrees of rake, crosscut teeth with fifteen. These angles are a good starting point for most users, but can be easily adjusted when you sharpen it. The back end of the blade will need to be clipped off at an angle to fit into the handle. (Note: usually this was already done by the maker) An angle grinder, hacksaw, metal shears, aviation snips, belt sander, or even a file will work. The sheared edges will need some truing and smoothing, which is easy to do with any decent file. Making the holes for the bolts can be the cause of much angst, but a solid carbide spade drill bit makes quick work of this task if you have access to a drill press. Blades are deblued, but not sanded or polished. Expect minor scratches from material handling; wet/dry sandpaper can be used to remove these and take it to the level of finish you like. Blades are leveled (flattened). While this process removes the majority of the distortion, expect to do some minor work to flatten it completely after assembly. To properly tighten or loosen split saw nuts, it is imperative to use a properly fitting spanner. This spanner fits the split nuts offered. With a tip that is 0.031 inch /0.79 mm) thick - just 0.001 inch (0.025 mm) thinner than the slots in the nuts -, there is no chance of damaging the nut. The tip is reversible, with one end being used for 7/16 inch (11.1 mm) nuts and the other for 1/2 inch (12.7) and 9/16 inch (14.3 mm) nuts. 2-1/2 inch (63.5 mm) overall length. The adjustable T-handle provides all of the torque you will ever need, and is removable. 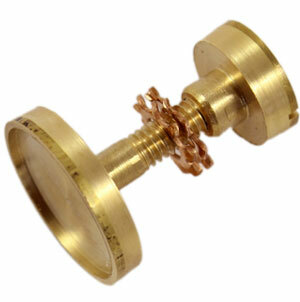 All components are made from brass or stainless steel. A 7/64 Allen key is included.